Sorry for the repeat for those of you who are following Lady Kirkbay, but here is a bib I just finished knitting for Chloe. 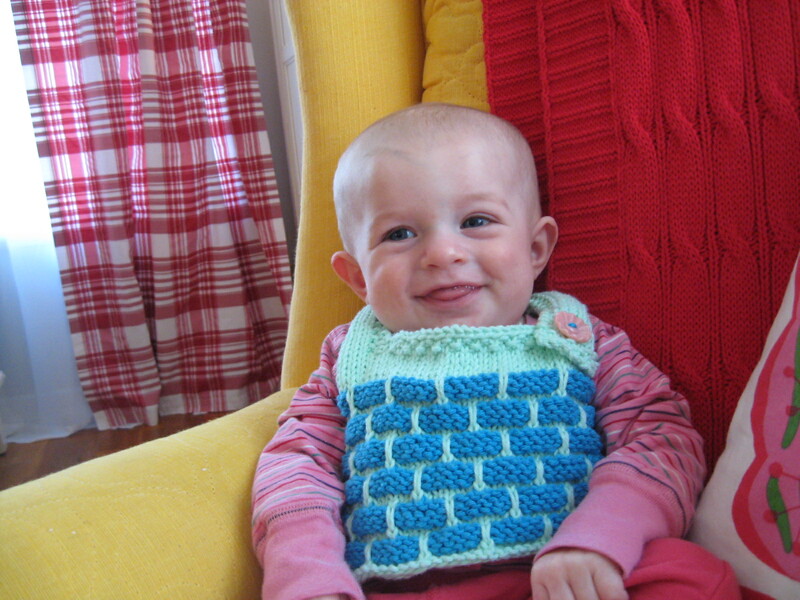 It uses the stitch pattern from my favorite dishcloth, but with the necessary mods for a bib. I think it turned out pretty cute. I haven’t shared any recipes in a while, but trust me that I haven’t forgotten. I have been cooking a lot of dinners from Cooking Light (I really love their recipes, and can’t recommend them highly enough). New family favorites include the pork tenderloin kebabs, sun-dried tomato chicken salad in pitas, and the strawberry/oatmeal/white chocolate cookies. I have a couple new ones to try this week, so we will see if they make it to the repeat list. We are huge fans of Pork Fajitas with mango (although I use more lime juice, cumin, and soy sauce, and top with avacado too), Sweet and Sour Chicken, and Thai Beef Tacos, all of which I originally made from Cooking Light. I will try to link to the online recipes, but you can find most of them with a simple search on the Cooking Light website. Thank you for the snip-it. It is good to see you are still kickin hard. I am with you in your love for Cooking Light, but I have never thought the name matches up with their wonderfully hearty food. I am hoping for the recipes to some of those foods you mentioned above. My mouth was actually watering while I was reading your post… time for lunch! That baby has the most lovable face. The bib is also very nice. Those recipes sound fantastic. Thanks for the tips, Rachel! I love cooking, but I just recently ran up against one of those walls where you feel like you’re always cooking the same stuff and not liking any of it. Oh, hey, one question: whatever happened to Happy Heather? Ahem, ahem. I mean, I see you around, Heather, so I know you’re alive; and you look pretty happy, too, so…what gives? LOL! I predict that Lina is going to do very well in Latin someday! Thank you for sharing those stories, Rachel, those were hilarious! You are amazing with your “4 under 3!” With as cheerful as you are your kids must just be bursting. LOVE trying new recipes!! Can’t wait to hear more of your favorites!! I tried the strawberry white chocolate cookies and mine ran together and were very greasy and “holey”. Just curious if yours do that too? I did do 1 1/2 times the recipe so maybe that changed it? Anyway, they tasted good, they just fell apart and were quite oily. mine didn’t do that at all, no idea why that happened to yours. Did you half the egg? Another idea is that I didn’t bake on a greased cookie sheet like it says, because I am addicted to parchment. Hmm. I baked on a silpat. Have you ever tried one? Do you prefer parchment over a silpat? Can you reuse parchment? I do have a silpat (and like it a lot), but I only use it if I am out of parchment. This state of affairs is rare, since I buy parchment from a restaurant supply company in boxes of 1000. They are wonderful! I do not re-use parchment, but we use it for everything. I sometimes bake with things all wrapped up in it, always put it on the cookie sheet (they are pre-cut to cookie sheet sizes), and use it as art place-mats for my kids (we use the side for a paint pallet). I even use clean sheets to gift wrap baked goods. I told you I was addicted!